This top is my definition of a year-round wardrobe staple. 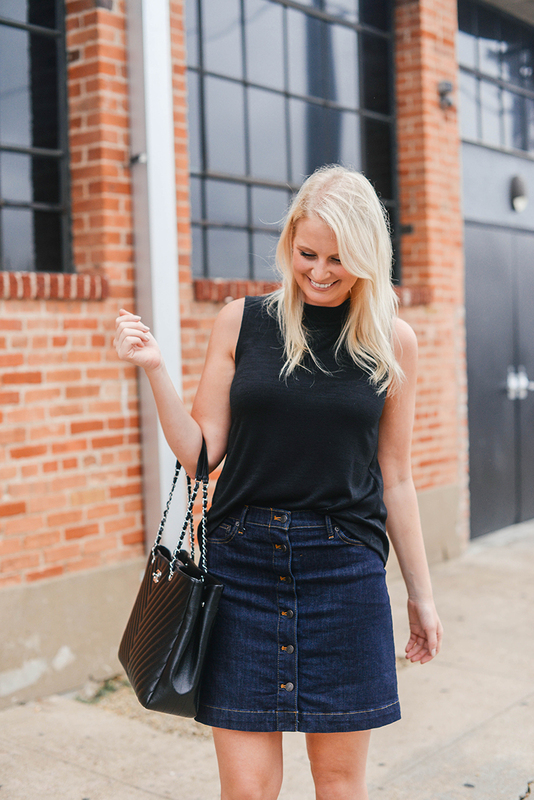 While it’s still hot out, I’m pairing this Hudson mock neck top with skirts and shorts. Come cooler temps I’ll be wearing it under my favorite jackets (like this one) with jeans and leather pants! Because it is sleeveless, this style of top is comfortable in hot temps, but in cooler temps it layers effortlessly with any kind of jacket – even those with snug sleeves! 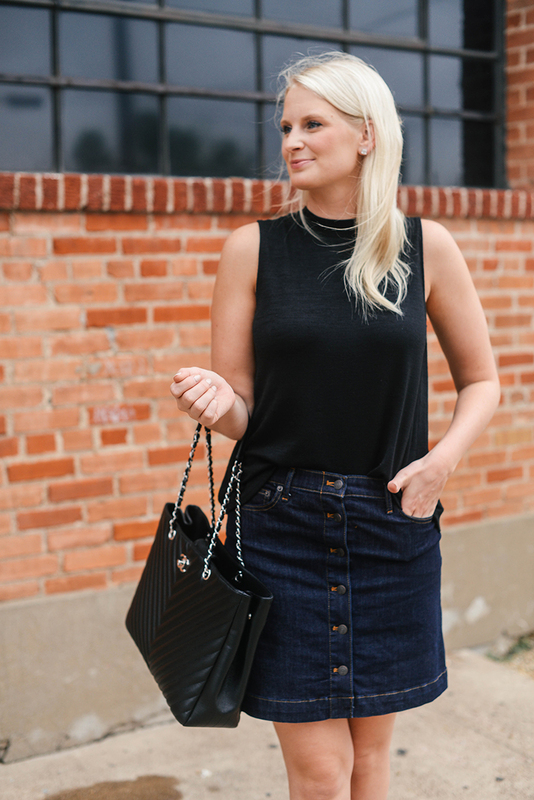 Another amazing transitional item is this dark denim skirt! It’s under $100 and keeps me cool when paired with tanks right now, but will look fab with your favorite sweaters come fall weather. For more transitional style staples, head over to THE SHOP! I’ve added a bunch of new favorites! minimalist perfection, love this look. I am dying over your top and bag! So chic! Great skirt! I have been looking for a similar one for a while. I snagged this skirt earlier this week. Love this look so much! Hey Merritt! I’m so excited to catch up on your posts. It’s like sitting down to read I love a favorite mag:) ! I adore this simple, timeless look. I actually picked up a similar top from Madewell earlier this summer and It turned out to be such a staple in my wardrobe. Also, loving that skirt! Such a great day to day look! 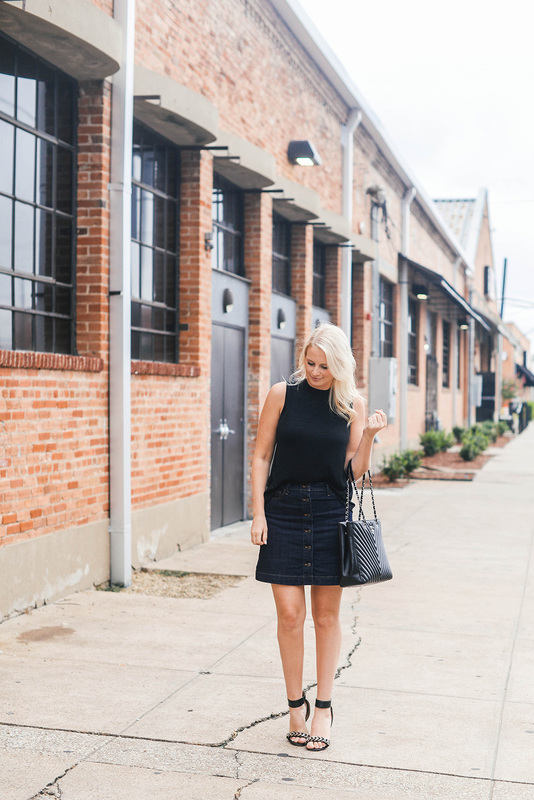 The A line denim skirt is so chic! A sleek monochrome look like this is a classic! Your heels are so chic! So simple, so chic. Love those shoes! Love this look on you, lady! Happy Wednesday! This is my kind of outfit – simple, but elevated! Love this! I’m realizing I need to get new basics like this!